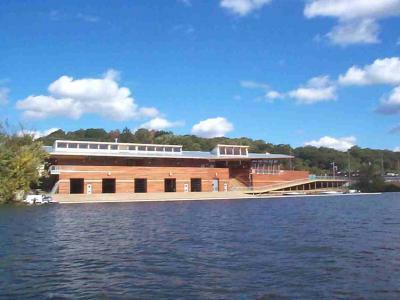 One stipulation of the Gilder gift was that a community rowing program be established at the site, allowing New Haven and Naugatuck Valley youths to learn rowing skills during the summer. 2001 will mark the third year for the program. 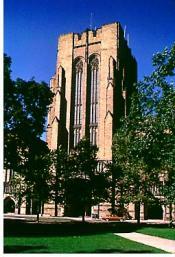 The Yale gym is one of the largest athletic facilities in the United States. Close to the residential colleges, Payne Whitney Gym, named for the captain of the 1898 crew, becomes the winter home for the bulldog crews. The core of this magnificent building is the most complete indoor rowing facility in the world. There are three moving water rowing tanks, ample spaces for over 40 rowing ergometers, cirsuits and stretching. In addition, the athletes make full use of thirteen flights of stairs in the gyms’s tower and the 25,000 square foot varsity weight room where strength coaches Steve Plisk, Russ DeRosa and Aidan O’Connell supervise the weight training program. 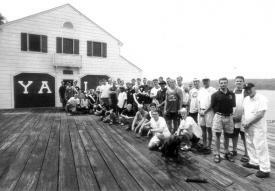 For more than 100 years the Yale crew has traveled to Gales Ferry near New London, Connecticut to prepare for the nation’s oldest intercollegiate sporting event, the annual four-mile race against Harvard. This facility, owned and operated by the Yale heavyweight crew, has been virtually untouched by the 20th century. It stands as an important part of Yale’s history in the sport and the event is known as The Race. In 1852 the first Yale-Harvard race launched competition between colleges in athletics. The first race, organized as a promotional event by a local lodge, was raced in six-man boats without coxswains over a three-mile course on Lake Winnepesaukee, New Hampshire. Not until 1896 did the race become the annual four-mile event in New London. 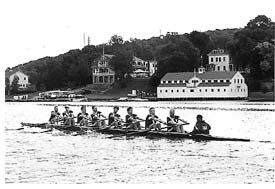 In 1870 Yale broke with tradition by integrating the legs into rowing. Yale oarsmen wearing greased leather trousers slid up and back on smooth wooden plates mounted where the tracks of the slide are today. Today, the oarsmen finish exams and travel east along the Connecticut shoreline to Gales Ferry for a training camp and experience that connects them to all of the men who have trained for the long distance races against Harvard. The athletes focus on training. It is not a place of distraction. At the Ferry there are no televisions. 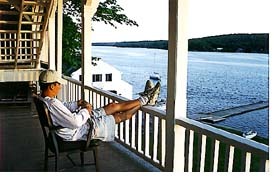 A newspaper over breakfast is an oarsman’s connection to the outside world. Between rows, oarsmen play cards, write letters, read or practice for the prestige event of leisure, the annual croquet tournament. Meals, prepared by Yale dining hall cooks and managed by Brian Frantz, are eaten together in the large dining hall. A Yale staff volunteers to take care of the team. In this setting championship crews are made. Yale athletes enjoy training in three very different worlds: on the Housatonic River, in a gymnasium designed for rowing activities and on the Thames River. The following descriptions help you see where the crews pick up speed.